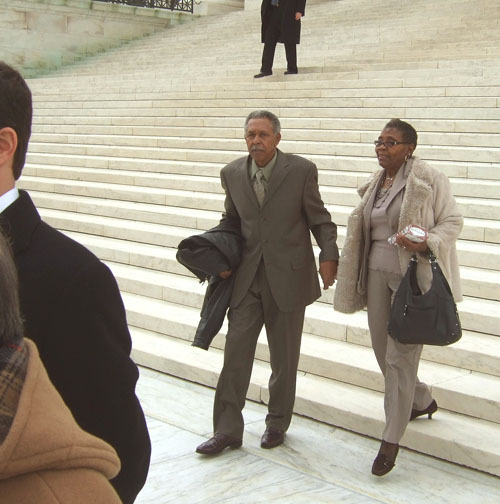 Otis McDonald, petitioner in McDonald v. Chicago, has gone to his rest. Here he is, with his wife, on the steps of the US Supreme Court after the oral argument, four years ago. Here's his memorial Facebook page. A good man, and a moment in human history. As I recall, about half of Americans own guns; isn't often that an individual can pass on and have 150,000,000 people, and the generations who succeed those, in their debt. I wish him God speed. He was a man of rare courage. Rest in peace my brother and friend. You're legacy fourthrightness and dedication will sustain us for centuries. Thank you. This country owes this noble man more than it thinks. Man od commitment, and resolve, rare these day to stand up for ones inalienable Rights.